Known for welted country shoes, Tricker’s is a family-owned shoemaker founded in 1829. With a wide range of clientele, from the genteel estate owner to the edgy creative, it’s become appreciated by all for its quintessentially British quality. Since 1829, Northampton-based Tricker’s has consistently been making welted country shoes to an impeccable standard. Founded by a cobbler named Joseph Barltrop, the business is still owned by the same family and is now widely regarded as being an exemplary British heritage brand, and with a Royal Warrant to boot. With winter in full swing, there’s no better time to combat unruly weather with sturdy footwear, and there’s simply no one better for that than Tricker’s which celebrates its 190th anniversary this year. Throughout the 19th and 20th centuries, Tricker’s established itself as a major player in what was then a saturated industry. Like most shoemakers of those times - almost 200 in Northamptonshire alone - it contributed to the war effort, making boots for officers and troops alike. For a brand with such history, in addition to its loyal clientele, Tricker's has developed an almost cult-like following. “I'll admit we have a bizarre mix of customer,” Martin Mason, Managing Director of Tricker’s, tells The Rake with a smile. “You’re just as likely to get a burly farmer from Yorkshire; or someone from White's Club dressed-up and getting his brogues for his country pad in the afternoon; or a 22-year-old Japanese DJ coming into the store.” Indeed, that is a bizarre mix of customer and one that raises the question of ‘how exactly?’ The answer lies in the common denominator between all three: an appreciation of quality. “We’ve been here since 1904 and in fairness, not a great deal has changed other than electricity and WiFi in certain spots, if you're lucky,” says Mason jokingly as we sit over coffee in the showroom prior to the grand tour. 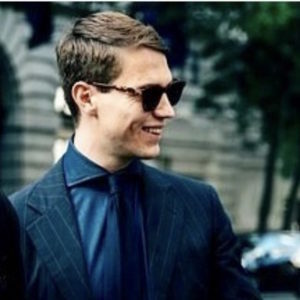 A great deal of credit is due to be given to Mason, who joined the company in June 2015 and during his tenure has helped launch the shoemaker’s e-commerce site and seasonal collection, both of which have propelled Tricker’s forward. Exports are through the roof and are mostly heading towards Asia to clad the feet of said DJs. Mason goes on to tell me that many Northampton shoemakers have now become pigeonholed and known for producing one style of item to great standards. This is perhaps understandable, but in Tricker’s case there’s no doubt that it’s best known for country footwear, for which it’s the top of the class. In equal company to the production process of Northampton’s most prestigious shoemakers, within the walls of its old-school factory, Tricker’s cut all the uppers by hand one by one and then adherently close them using various types of machinery that demand dexterous, skilled hands. 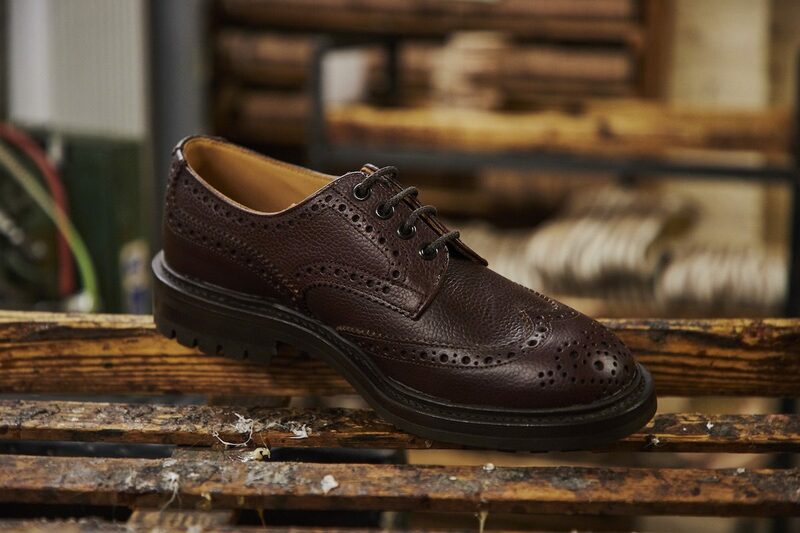 It’s labour intensive work and Tricker’s is well-known for its style of heavy broguing and other intricate details. As such, the processes that take place in the closing room are of the utmost importance to maintain the brand’s aesthetic. The brogueing is particularly noticeable on the Bourton brogue and Stow boot, which are the shoemaker’s most popular two models and were originally designed in 1927. “Each of us has our own identity and for Tricker's it's all about country footwear. If any other company tried to do this [holding up a Bourton], it would just look like a fake Tricker’s,” Mason adds while walking through the closing room. Once the uppers have been assembled, the beginnings of the shoe enters the lasting process. On the whole, Tricker’s lasts favour a wide foot — the slim, dainty European style wouldn't last three rounds with the quintessentially British style, with a short, round toe. The uppers are tacked onto the lasts and the leather is then pulled over the form before resting upon it for a few weeks to take its shape. Following this, the Goodyear welt is applied, which essentially gives the shoe a guaranteed life of many, many years as the welt can always be repaired when worn through. Goodyear welted construction has become a bit of a buzz word in recent years to help market footwear, but nowhere is the construction more prevalent than in Northampton. A Goodyear welt sees a material rib joined to the insole, which then allows the welt to be applied through the upper, which is tacked and pulled onto the last before a period of two to three weeks of rest. Once suitably rested, cork fills the cavity that the material rib and upper creates, which adds further comfort and waterproofing. The soles are then attached, trimmed and sewn through to the welt, completing the construction. It’s something to be admired, and is a sign of hand craftsmanship and quality and in regards to Tricker’s adds to its chunky, rustic aesthetic. The shoe then embarks on the final stage of the process which involves burnishing, polishing and finishing before packaging and delivery. Tricker’s range of country shoes are all understated in their tone, playing off various shades of brown, which over time will develop a beautiful patina. There’s no denying that Tricker’s is a global force in the shoemaking world and when it comes to sturdy and durable ready-to-wear shoes, it tops the list. “People now want something that has provenance, and something that is unique. Brands like us, and dare I say it, others in the town, it's a great time to be doing what we are doing,” Mason adds as the tour comes to a close. Favoured for its quality make, timeless designs and brilliant history, Tricker’s has an obvious and distinct aesthetic of British sensibility. A great selling point, if you’re unaware of Tricker’s and have made it this far, start with either the Stow or Bourton; they’re best-selling models and will quickly become your wardrobe's best friends.